The US NAHB housing market index came unchanged and today Euro-zone’s construction output for January and the ZEW economic sentiment index for March will be released. The support rests at 1.13320 with resistance at 1.13630 which both lines are above the weekly pivot point at 1.12970. The EMA of 10 is moving with bullish bias in the ascendant channel and it is above the EMA 200 and the EMA of 100. The RSI is moving in overbought area and the Stochastic is showing upward momentum. The MACD line is above the signal line in the positive territory. The ADX is showing buy signal. 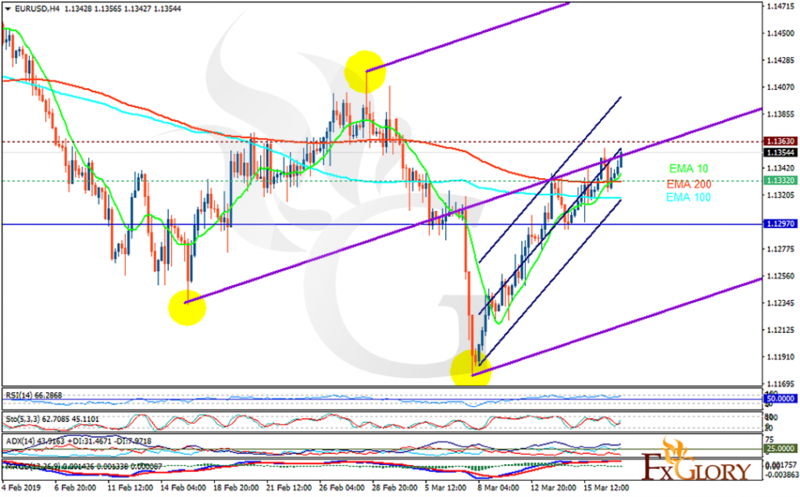 EURUSD may continue its bullish trend within Andrews’ Pitchfork targeting 1.14000.